The Gerald R. Ford Presidential Library has digitized the declassified contents of every folder in the collection "National Security Adviser. Memoranda of Conversations" - the Library's most popular and most used textual collection. Digital copying of this collection was made possible by generous support from the Gerald R. Ford Presidential Foundation. 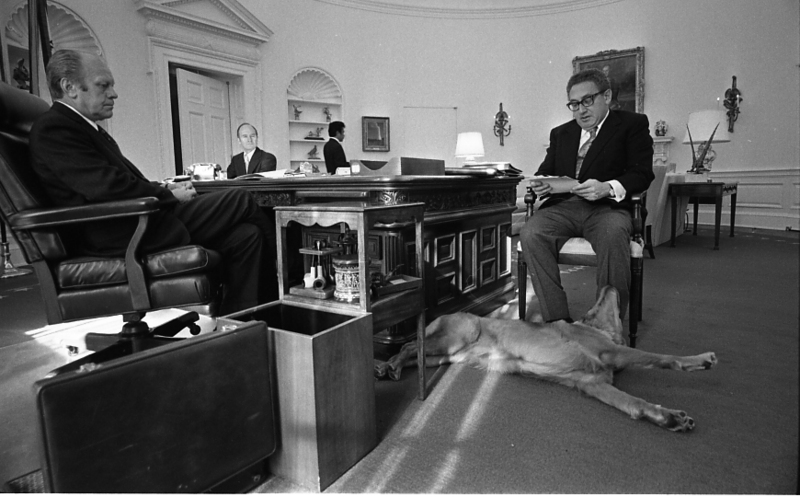 Each folder of the Memoranda of Conversations (or "Memcons") contains the White House's transcript-like records and handwritten source notes from over 1,000 presidential meetings on foreign relations and national security matters, January 1973 - January 1977. In addition to Presidents Richard Nixon and Gerald Ford and Secretary of State Henry Kissinger, participants included foreign heads of state and diplomats, U.S. intelligence and national security officials, U.S. diplomats, members of Congress, Cabinet members, visiting delegations, and others. Discussion topics were myriad. The memcon scans are stored as PDF files. They require the free Adobe Acrobat Reader®. Adobe® also provides free PDF tools for the visually impaired.